Some of us are good about organizing our school binders and notebooks, but then we drop the ball when it come to organizing our backpacks. Why? I have no idea, lol. 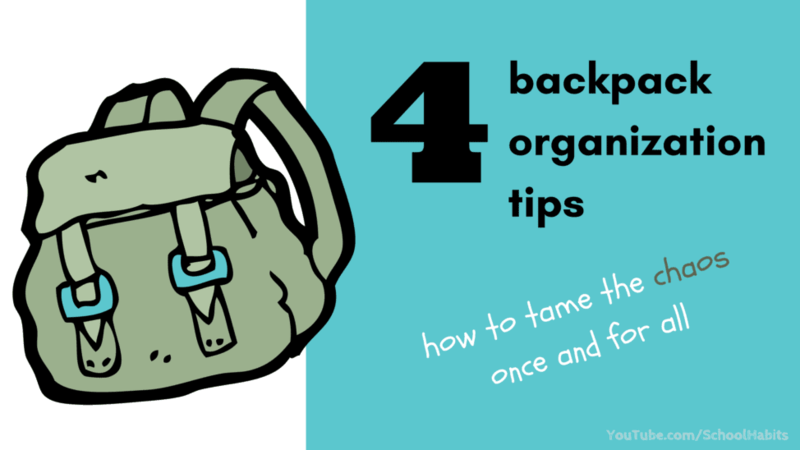 But here are four backpack organization tips that will help you keep the good stuff in and the bad stuff (the chewed up pen caps)out. 1. Use and keep a Limbo Folder in your backpack. I made up the phrase “Limbo Folder” (ha, I make up names for things all the time!) to refer to a folder that we use to put all the papers that we don’t quite know what to do with in the moment. Here’s the blogpost where I go into detail about the Limbo Folder, but basically having a place to temporarily store “homeless” papers (old tests, handed-back classwork, etc.) keeps the papers from getting scrunched up at the bottom of your bag to die a slow death. Instead of cramming papers in your bag when the bell rings, put them in your Limbo Folder to be dealt with later. Here’s how to handle old school papers if you’re super confused about that. 2. Throw your trash away! Seriously, there is no need to stuff your protein bar wrapper in your front zipper pouch when you’re done with it. (OMG I’m totally pep-talking to myself here.) There’s no need to throw your broken pencil or dried up pen back in your bag after you discover it’s useless. Most schools basically have a trash barrel in every room, and if you’re on a campus, there’s probably a trash barrel on every corner. Not only does trash clutter our backpacks, but the nasty stuff can make our bags even more nasty over time. (Think mold!) So really, good backpack organization begins with keeping the junk out. 3. Use your pockets wisely and consistently. Most backpacks have a variety of internal and external zip pouches or pockets. (No joke, I just walked over to my own backpack to count my zipper compartments and I have eleven. Eleven!!) Proper backpack organization involves giving each compartment a purpose, and then sticking to it. For example, I have a teeny tiny zip pouch on my actual backpack strap that I use only for storing my USB. I have a long external zipper pouch across the top that I use only for pens and pencils. I have another small zipper pouch on the side that I pack my protein bar in (it doesn’t last long in there because whenever I know I have a GoMacro Bar stashed away, I can’t stop thinking about it until I just eat the darn thing already). Here’s my point: knowing that my pens are always in the top zipper pocket prevents me from frantically digging through my bag to find one. Knowing that my USB is in the little strap-zipper thingy prevents me from having a panic attack thinking I’ve dropped it somewhere. My backpack organization tip for you is to lay out the materials and tools you typically carry with you (calculator, pens, highlighters, computer chargers, snacks, personal items, sticky notes, etc. ), and then figure out a specific compartment in your bag to put that item. And then put it there. Always. And then put it back there. Always. I suggest that every Friday — or if you’re in college, whatever day is your last day of classes for the week — you dump out your backpack. Take out the big items like textbooks, and then literally dump the bag upside down to get out all the bits and crumbs and crap and loose paper clips and paper fragments and elastics and gum wrappers and pennies and lord-knows-what-else. If loose papers fall out, deal with them or at least put them in your Limbo Folder. If you find a rogue pencil in your calculator compartment, put it back in the right spot.